1 Why are ceramics important? - Sarah Archer - Heart like a wheel: What is Hollywood telling us about working with clay? - Imogen Racz - Sculptural Vessels across the great divide: Tony Cragg's Laibe and the metaphors of clay. - Emmanuel Cooper - The Arts and Crafts Movement. GB, USA, Germany and Austria, Scandinavia, The Netherlands, Hungary and Italy. - Brent Johnson - A Matter of Tradition: A Debate Between Maguerite Wildenhain and Bernard Leach. - Lesley Jackson - Contemporary design of the 1950's Rie and Coper in context. - Edmund De Waal - Towards a Double Standard? 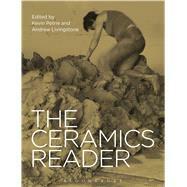 - Jeffrey Jones - Studio Ceramics: The end of the story? - James Beighton and Emily Hesse – Why Clay?